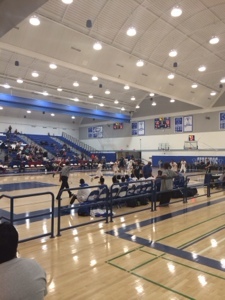 Cerritos, Calif. – Mid Major Hoops Report was on tap at Cerritos College in Cerritos, CA for the annual Cavalier Classic powered by Serra High School in Gardena, California. The showcase style event featured teams from all over the West Coast such as Lynwood, Renaissance Academy, Saddleback Valley Christian, Mayfair, Muir, Lawndale, Serra, St. Anthony, Clark, NV, Cantwell, Sunnyslope, Westchester, and Sheldon, Sacramento. The top athletes selected were based on performance shown by each athlete today and not their College projection or reputation at the grassroots level coming into todays showcase. Athletic/Long combo guard, has good lift on his jump shot, good defender who can defend bigger guards with his length. Long, Smooth Lefty with a good feel for the game, shoots the mid range very well and can hit the 3 ball, Solid on ball and excellent off ball defender. A very athletic guard with bounce, Slasher type of game, gets to the rim off two dribbles max. Long athletic who can alter shots on defensive end, good timing on blocking shots effectively, needs more post moves and face up to the basket moves for his position. High motor on both sides of the ball, can score with the best of them, always under control in high pressure situations, knows how to draw contact/fouls to get easy free throw points, very good in pick n roll situations, has good one and two dribble jump shot ability. High motor, runs floor well, Excellent helpside defender, needs to work on mid range and three point shot. Savvy handle with good passes into post and Pick n Roll, long arms that add to his solid on ball defense, needs to add muscle to his frame for next level. Big/Long body with strong core, alters shots with arm length, need to add goto post move, needs to work on short corner jumper. Strong body guard, slasher who can get to the rim, fast first step, solid handle, physical on ball defender, offensively would like to see him shoot the ball more, needs to add seperation moves to his arsenal. One of the more impressive prospects of the day at the Cavalier Classic who had 6 blocks in the 1st half and a few powerful dunks in this game. Chemezie is a HIGHLY active rebounder on both sides of the ball, always shows authority in the paint, knows how to use his length for a dominant advantage, he makes good passes out of the high post, needs to work on his footwork down low, needs to establish go to post move and really needs to learn a “face up” game for a forward his size. Long arms and very athletic with major bounce, shows promise, he is very timid on offense, he needs to take more shots within teams offense and attack the basket more, he will be really good if he continues to work on his three ball and dribbling skills. Head strong point guard, solid handle, very quick feet, makes good decisions in traffic, at his best finding teammates in transition, What i like best about his game is “If he is not attacking the rim he is always moving the ball attacking the def. with the pass”, Jackson needs to create more shooting opportunities off the dribble and catch and shoot opportunities. This player just grows on you as the game gets tougher and more physical for his team, the ball just attracts Joey to lead the way and he always accepts the challenge as he did in a clutch win versus a good sunnyslope (Ariz.) team led by Pangos All American 6’9″ forward Michael Humphrey. Joey is a back to the basket styled point guard, he knows how to use his body to protect the rock and uses his hips to bump his defenders off him to create space to attack the rim, he has good hesitation moves to go with his solid ball handling skills, he pounds the ball old school style, he has great shooting form and can shoot the three ball effectively but needs to shoot more especially off the dribble, I believe this is a key reason why college coaches hesitate to give him a true look. All i can say is the kid can play and hes out playing top tier D1 athletes at their own game. Give him a shot! Mid Major Hoops Report would like to thank Serra coaching staff and event promoter Johnny Hernandez for the A+ hospitality and for such a great event for all of us Hoop Junkies.